With simple mindfulness activities, healthy recipes, and suggested itineraries to recharge, build community, and inspire creativity, this beautiful photo book is full of ideas that will inspire anyone seeking relaxation and reconnection. A great gift for all the busy people in your life.... and yourself. Here is your guide and inspiration for a weekend retreat to inspire renewal. 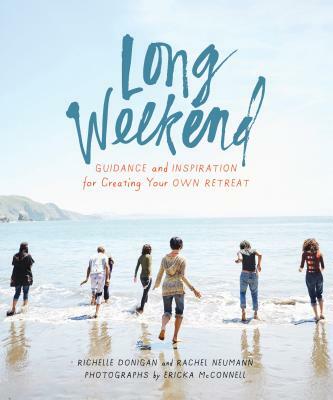 Whether you sneak away with some friends or just turn off your devices and hide the to do list at home, Long Weekend is full of ideas to spend a creative, artistic, technology-free weekend filled with exercises and resources that will leave you feeling refreshed and rejuvenated. Includes basic itineraries for how to shape the time in addition to rituals of renewal provided by experienced retreat leaders Richelle Donigan and Rachel Neumann. Beautiful photographs by lifestyle photographer Ericka McConnell will transport you, so that reading the book feels like a retreat in itself. Great for armchair travelers as well as those looking for help planning a weekend away.